An Africanized breed of honeybees, sometimes known as killer bees because of its swarming, aggressive and deadly nature when its colony is threatened, has found its way to the Bay Area for the first time, researchers say. The bees were found in a Lafayette subdivision called Reliez Valley, near the southeast side of Briones Regional Park, by UC San Diego researchers who have been tracking the bees movement throughout the state. Until now, the bees had been detected only as far north as Mariposa County in Californias more inland Central Valley, but are likely attracted by the Bay Areas warming temperatures. Joshua Kohn, a professor of biology at UC San Diego, said it is hard to tell at this point how many of the bees there are in the area. 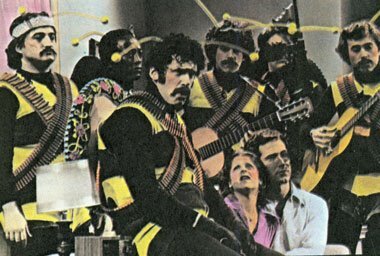 Maybe God will have the killer bees sting all the queers in San Francisco resulting in a much smaller, much safer, much more livable city. Honestly. they can never given it up. “Warming temperatures.” Lafayette has a very temperate climate. Except for hard freezes every so often you can grow citrus and subtropicals through most of the Bay Area. My brother keeps bees here in San Jose. Send PETA to clean the area. They love animals and insects before people, right? Irwin Allen's The Swarm (1978) bombed at the box office, earning only $10M gross on a budget of $21M (IMDB). It pretty much ended his career as a maker of big disaster films. I thought we were headed into fall and winter. Oh wait, CLIMATE CHANGE! We're all gonna die! Run for the hills before the Bay rises up to drown you! I was hoping to see Swarm vs. Jaws. Best news I’ve heard all day. There are certainly many that are ripe for a sting. PETA is too busy filing a lawsuit so that a monkey can obtain a copyright over the selfie that it took. In the 1970s I remember the MSM publishing news articles that quoted scientists who gave dire warnings about how the ‘killer bees’ were going to harm US agriculture, cause 1000s of deaths annually, force everyone indoors, etc. Cue the “That’s Racist” gif.